Indeed, the timing couldn’t be more fortuitous than now for her “Burma: Rivers of Flavor” (Artisan), a book that’s been in the works for four years. If the world’s collective eye wasn’t already drawn to this sovereign state in Southeast Asia, also known as Myanmar, it surely is now that it is transitioning after five decades of military rule. Its most famous democracy activist, Nobel Peace Prize-winning San Suu Kyi, finally freed in 2010 after 15 years of house arrest, was elected this year to a seat in that nation’s Parliament, as were 43 members of the National League for Democracy. 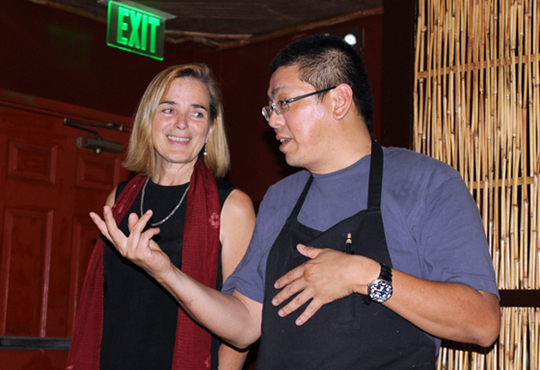 As Duguid told a dinner crowd of about 30 at Betelnut in San Francisco last week, she’s grateful to have experienced the country’s “before” and “after” transformation, having visited most recently late last year. Duguid was the guest of honor at the dinner, hosted by the Asia Society, the global non-profit that supports educational, business, arts, culture and policy projects in Asia. 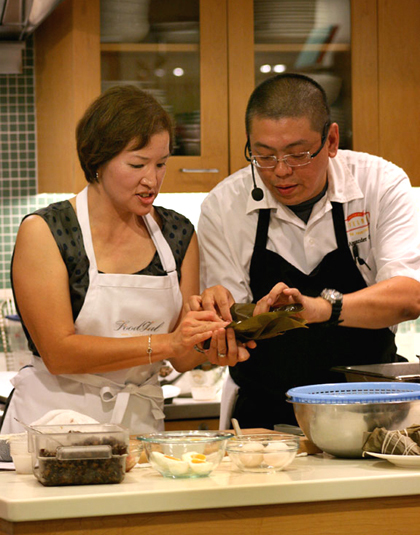 Betelnut Chef Alex Ong, a board member of the Asia Society, did the honors in the kitchen, crafting a multi-course, family-style dinner of dishes featured in Duguid’s book. They don’t overwhelm. They’re more nuanced. Peanuts, turmeric, dried red chiles, limes, ginger, garlic and an abundance of shallots are cornerstones for the cuisine and made plenty of appearances at this dinner, to which I was fortunate enough to be invited. 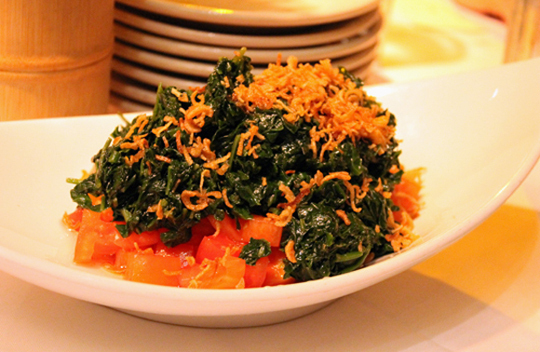 It began with green spinach and tomato salad, its lightness playing off the pleasant funk of dried shrimp powder and fish sauce. Fried shallots and chopped roasted peanuts added a mouthful of crunch. Next, Dawei fish soup, named after the town from which it hails. 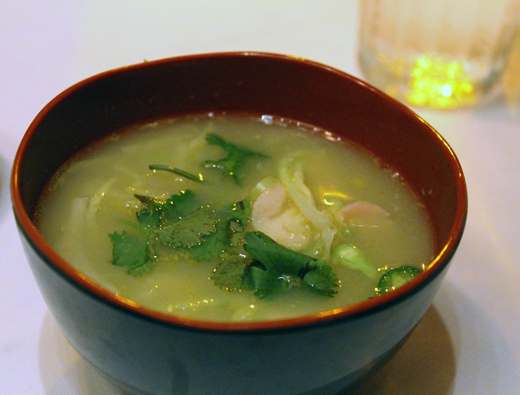 The thin broth boasted a complex flavor redolent of lemongrass, turmeric, galangal, chiles and coriander leaves. Chopsticks revealed slippery bean thread noodles and tender squid at the bottom of the bowl. 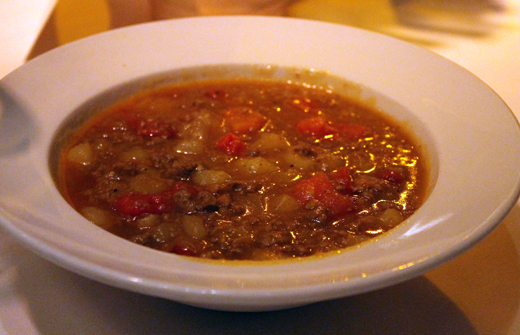 That was followed by a rustic dish of pumpkin in a sweet-tangy tamarind curry along with spiced ground lamb cooked with chunks of potatoes. 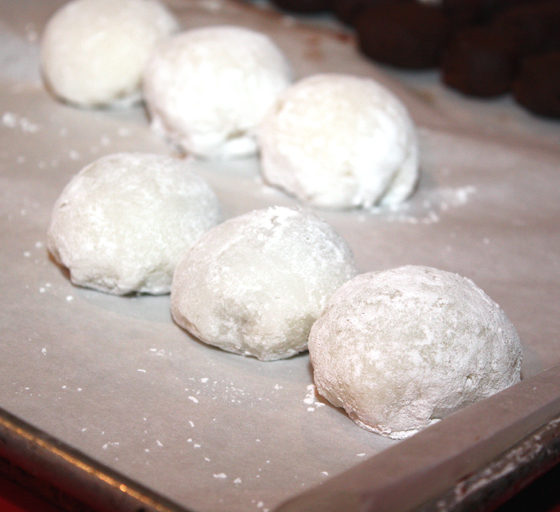 Together, they made for the perfect toppers for a mound of fluffy rice. 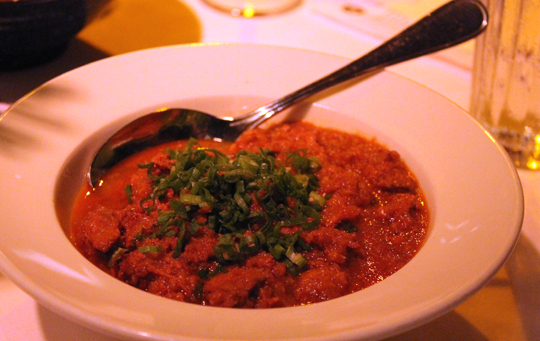 A saucy bowl of curried chicken livers was one of my favorite dishes. The thick, aromatic sauce of ginger, fish sauce, turmeric and crushed tomatoes married with the tender, creamy pieces of liver. Even if you’re not usually a fan of liver, this dish is bound to sway you. 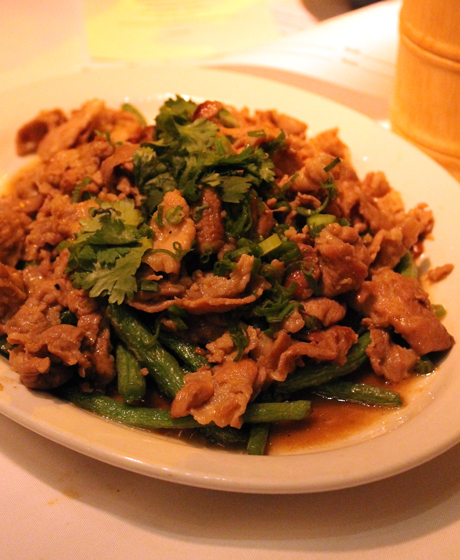 Next, a dish that definitely has Chinese roots — strips of pork bathed in star anise, garlic, ginger, soy sauce and fermented bean paste. 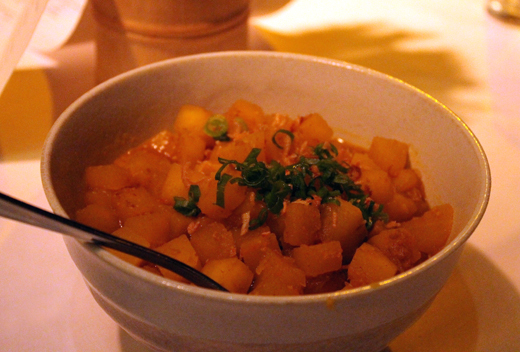 Then, what may very well be the most favorite dish of anyone who has traveled to Burma, Duguid says. 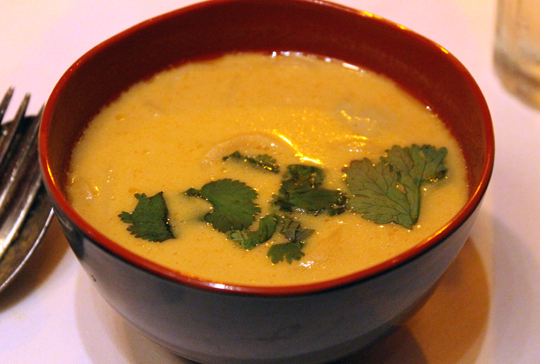 But who can resist egg noodles submerged in a velvety bowl of rich coconut milk sauce? It’s topped with fish balls, a squirt of lime juice and more shallots. The taste is sort of like Thai or Malaysian noodles — but with less heat. 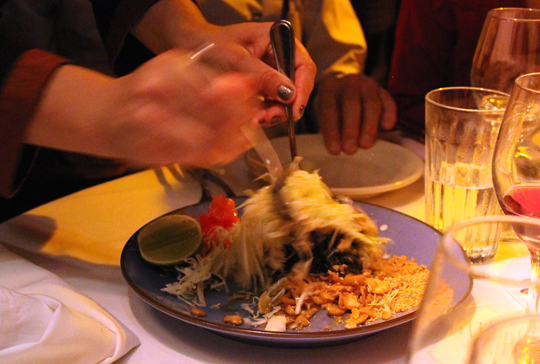 In a nod to real tradition, the famous tea leaf salad that’s the country’s national dish was served at the end of the meal rather than as an appetizer as it’s usually done at Burmese restaurants in this country. It’s meant to be more of a palate cleanser. With its bright flavors and many textures, it does exactly that by waking up your mouth big time. 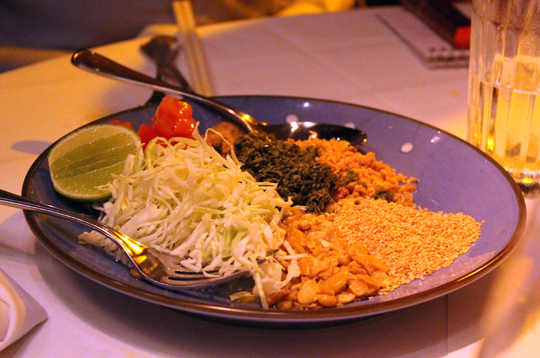 It comes to the table on a plate with little piles of fermented tea leaves, fried split roasted soybeans, fried garlic, toasted sesame seeds, tomato wedges, green cabbage and roasted peanuts. A dressing of garlic oil, lime juice and fish sauce is drizzled over as the whole thing gets tossed together. 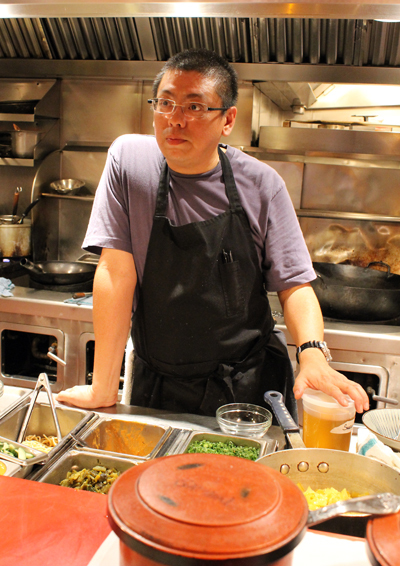 Chef Ong couldn’t find the requisite fermented tea leaves, so he made his own using Dragonwell green tea leaves that he soaked repeatedly to leech out much of the tannins, then squeezed dry before chopping. 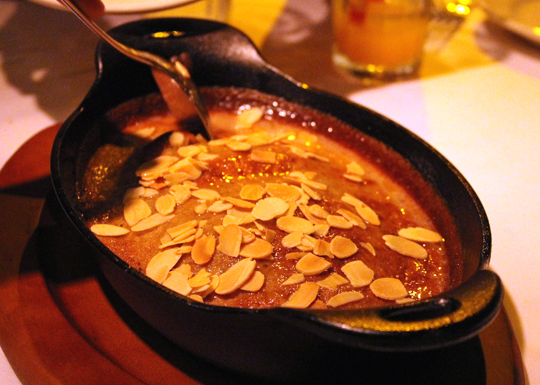 Finally, a Burmese semolina cake that Ong described as akin to warm cornbread — one topped with sliced almonds and a generous drizzle of butter. It was baked in a cast-iron pan, but had the moist, dense texture of a steamed pudding. 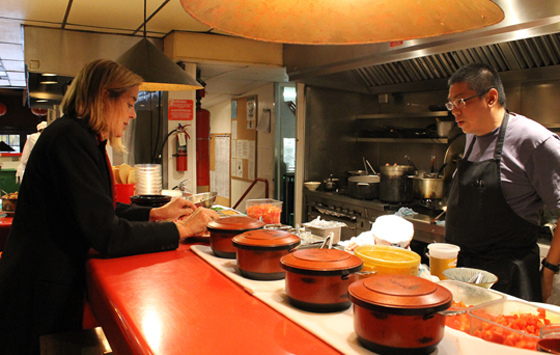 If you missed the dinner, you can take a taste of real Burmese food by making the dishes, yourself, as they are all featured in Duguid’s book. I can eat the tea leaf salad anytime. Sooo good. What a spectacular meal! I don’t know anything about Burmese food, so thanks for the introduction. I’m not familiar with Burmese food at all. Sounds like a wonderful recipe book to learn more and to cook along. 🙂 The curried chicken liver is definitely something I would totally appreciate. 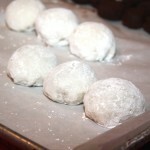 Mouth watering when I hear chicken liver! And the corn pudding cake in cast iron pan sounds just as wonderful. Naomi Duguid writes such good books. I don’t have every one she’s written or coauthored, but lots. What’s been going on in Burma is so interesting, and she’s had a front row seat. Thanks for bringing her book to my attention. 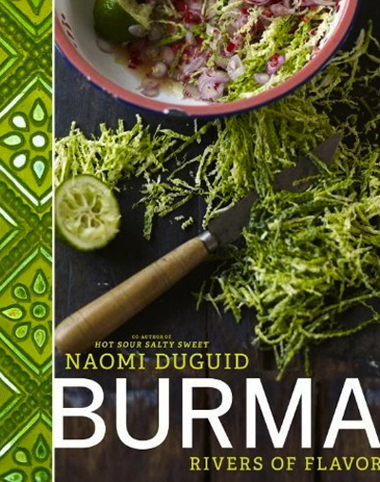 I don’t have any of Naomi’s books or know much at all about the Burmese culture or food. This sounds like it would be a nice book to add to my collection.